Today, Father Joe and I invite you to join us in reflecting on the sacrifices made by our neighbors who are homeless, and I ask you to consider joining Anne as a recurring giver. Every donation, no matter how small, has the power to change a person’s life. The season of Lent is a time of reflection and renewal for me. 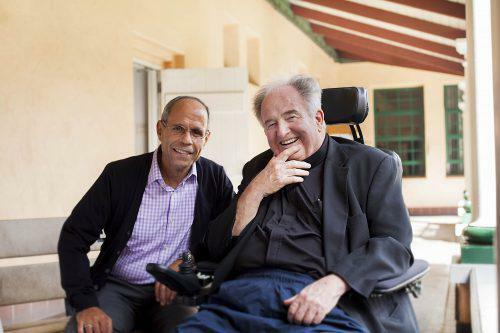 When I was at the Village recently, Father Joe and I took some time to reflect on this important season. Father Joe and I talked about the many personal sacrifices that our neighbors in need make every day. “I’ve experienced challenges with my health in recent years, but I am comfortably clothed, fed and live in my own home. It’s unimaginable what our homeless neighbors go through, especially if they suffer from health problems—and many of them do,” said Father Joe. There are so many things we take for granted that people on our streets go without. Imagine what it would be like to no longer have ready access to a hot shower, a soft place to sleep, regular meals or simple privacy. That is what people who live on the streets do without every day. Thankfully, we have programs that address these needs. At our Day Center at Father Joe’s Villages, for example, we provide restrooms, showers, laundry, computers, a mailing address, friendly conversation and so much more. But these necessities provide more than the practical benefits of cleanliness or a way to receive mail. They provide hope. A woman who had been living on the streets for eight years came to the Day Center to do her laundry but left with the resources and staff support she needed to make a positive, permanent change. Now, because of support from donors like you, she lives in an apartment of her own. In 2016, the Day Center provided more than 30,000 showers to people living on the streets and people did nearly 4,000 loads of laundry. Imagine how many lives have been changed. During your time of reflection this Lenten season, please think about our neighbors who live on the streets. Just like Anne, you can make an impact in their lives. Even though Anne only has a small disability income, she sends us $14 every month. Her $14 provides showers to 32 people. For those 32 people, showers mean they can face their day with the simple human dignity of being clean. That’s one of the reasons Anne has made a lasting commitment to help her neighbors in need through her recurring gift.